... when suddenly there arrived the most stunning bee I have ever seen! There was no question in my mind that it could be anything other than a bee by its shape and flight behaviour. Stunning metallic turquoise blue-green abdomen, well rounded like a bumble bee. In fact that’s how I would describe it - the metallic bumblebee. Its distinctive appearance enabled me to easily identify it as a carpenter bee. 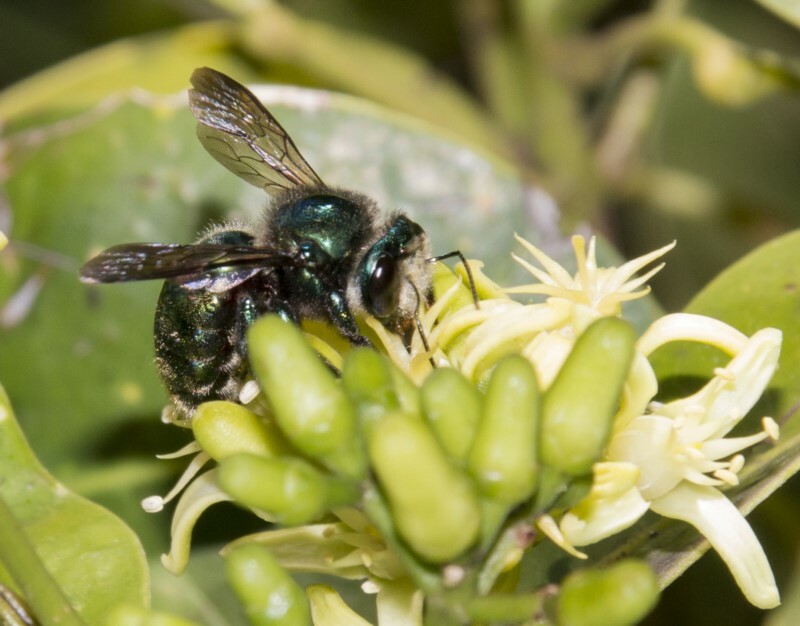 Carpenter bees are among Australia’s largest native bees, and - I believe - declining rapidly. I rushed back to the house to get the camera, but of course it didn’t hang around! I spent the best part of that day peering into every flowering bush on the property, all to no avail. Genus Xylocopa – species either X.aeratus or X.bombylans. 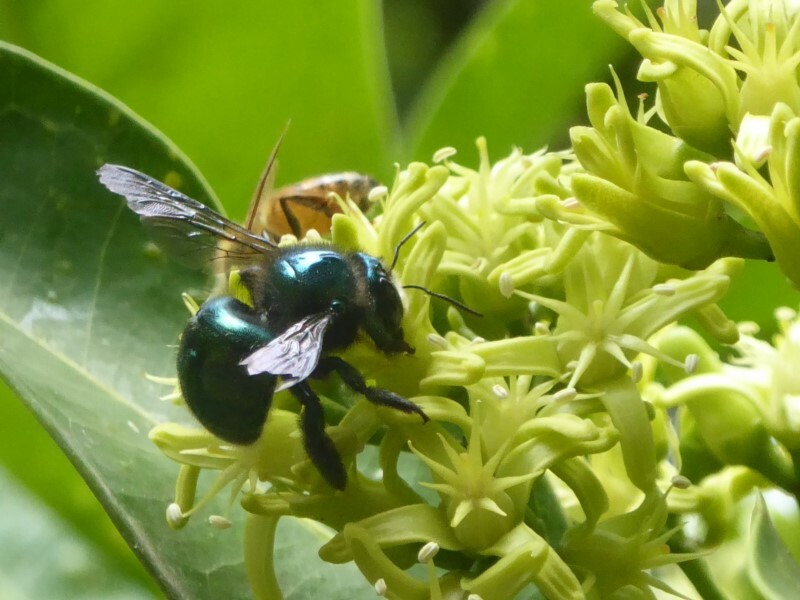 X.aeratus, the green carpenter bee, is probably the species most likely to occur in our region. Canberra Nature Map (CNM) have recorded several sightings of X.aeratus over the last 6/7 weeks, so it is worth keeping a lookout for these spectacular bees. There are currently no records in the Atlas of Life NatureMapr ... I will continue searching, and hope it overwinters so that I may see it again in Spring! Here are a few of the images from sightings in Canberra. Click here to see all Xylocopa aeratus sightings recorded on Canberra Nature Map. The carpenter bee nests by hollowing out stalks of grasstrees (Xanthorrhoea), or soft wood such as Banksia, Casuarina, Melaleuca and Leptospermum. The female excavates a tunnel with her jaws and picks up and dumps the wood shavings outside. The hollow can reach 30 cm long by 1.1-1.4 cm diameter. Larger pieces of wood may allow for multiple tunnels. Several female bees may use a nest, one breeding and the others guarding. A bee defends the 0.7-1.0 cm wide entrance by blocking it with its abdomen (compare Allodapula). Both male and female bees may overwinter within the tunnels. The tunnels are partitioned into several cells, where the mother bee lays an egg in each accompanied by provisions of nectar and pollen.